You can catch an on-demand recording of that webinar here. Our viewers had a lot of additional questions for Brenda and Suzanne, and our speakers were kind enough to share their answers here. Why does CBP think that drawback can be validated electronically under modernization? Modernized substitution drawback is calculated using the entry line value. Claims are prepared by referencing the correct entry line using the HTSUS and then by calculating the average value per line using the entered value and dividing by the line quantity and unit of measure. Since CBP receives and retains the entry details electronically, claims prepared accordingly can be received and validated electronically. Conversely, claims filed under Core drawback as well as Modernized claims under direct identification are calculated at invoice value and therefore cannot be fully validated electronically. Is the “other, other” rule an issue for manufacturing too? No – this rule applies to unused merchandise claims only. The “other, other” rule refers to the fact that substitution is based on HTSUS at the 8-digit level unless that classification carries the description “other”. If so, then substitution is based on classification at the 10-digit level unless that classification also carries the description “other”. If your classification meets both “other” challenges, then your claims must be filed under the direct identification provision rather than under substitution. If you unsure of the accuracy of your classification database, please contact us at consulting@amberroad.com, and we can provide support or a list of our upcoming courses on classification – you don’t want to miss an opportunity to secure a drawback refund due to a classification error. In the presentation you state that bills of material don’t have to be filed with claims. I thought I heard just the opposite. No doubt, there are a lot of details that now apply to the drawback claim, depending on whether you are filing under the current regulations or TFTEA rules. Initially the trade was told that TFTEA/Modernized claims for manufacturing drawback would be required to include bills of material when transmitting into ACE. Filers were concerned about this because in addition to often being quite sizable in their original state, BOMs are now required to include HTS numbers and ACE has filing size limitations that are already a challenge. Apparently CBP became concerned with the size of these transmissions as well and in proposed 19 CFR 190, amended that requirement. Now claims that include a BOM must include a certification statement of commitment to maintain all related BOMS and to present them upon CBP request. This is an excellent time to confirm you have a record-keeping program in place to account for this. What exactly is the process change as a result of “jointly and severally liable” related to third party drawback? CBP is formally putting third party importers on notice that they are a part of the drawback transaction and have compliance requirements. Procedurally, they are now included in the order of responsibility should CBP ever need to collect previously paid drawback dollars. Currently, if CBP needs to recover at liquidation any money previously paid under accelerated payment they will contact the claimant first and then the surety listed on the drawback bond. Under the new law, they now have the authority to pursue the importer as well, after the surety. Are the drawback offices approving privilege applications for programs under TFTEA? CBP has stated that they need finalized regulations to do so and quite honestly, that makes perfect sense. The final regulations should be forthcoming by the end of the year, if not earlier in 4th quarter. What exactly are we comparing under manufacturing substitution? Obviously not import to export. Under manufacturing substitution, you are comparing the imported material being designated for drawback to the actual material that was used to produce, or appears in, the finished product being exported. Therefore, you now need to determine the descriptions of that material as well as its value and the HTSUS classification that was used if it was imported or that would have been used if it was imported. Why does the regulation number change from 191 to 190, instead of 192? Funny, as we are supposed to be moving forward, not backwards! While we cannot say why or how CBP selected the new number, we concur that this move to modernization is a major move forward for both CBP and the trade. Do you have a similar program for how Drawback can be filed in the European Union? Over a 5 year period, both Drawback regulations and HTS codes can change, so one should know the regulations and HTS codes that applied at the time of Import, or Liquidation, which may be different from those applicable at time of filing the drawback - Does that make sense? You’re correct! HTSUS classifications can change from year to year, or after several years. With multiple classifications for the same merchandise in a single bank of available imports, or between imports from one year and exports from another, is substitution possible? CBP has stated from the beginning that changes in classification for valid reasons, such as an actual change in the HTSUS, will not have a negative effect on a company’s ability to file substitution drawback. These issues may require a bit of manual intervention to facilitate the recoveries. Are you not able to use the same entry for both Core and TFTEA or you aren't able to use the same entry number line number for both a Core and TFTEA claim? There may have been a bit of confusion on this topic, as we worked to quickly answer questions at the end of the program. 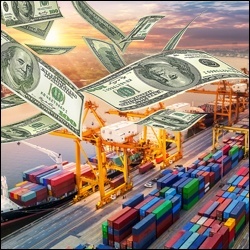 Expanding on what we presented, If you will be filing either unused or manufacturing drawback under substitution, you cannot designate the same line on an import entry on claims filed under both CFR191 and 190. This relates to what is required to calculate drawback under each set of regulations. Since the method of calculating drawback is different for each, once an import line is referenced under 191, it cannot be referenced under 190 and vice versa. We have an ACE account for Export AES, is this the same? I'm a little confused about the import/export HTS match. If we handle the import clearance, but someone else handles the export, how do you control the HTS codes used? This is not easy, but the more control you have over the classification of your products, the better for your company. It is highly recommended that you classify all of your imported and exported products, maintain an updated list and provide it to all of the entities that may be involved in classifying the transactions you will need to claim drawback. One of our suppliers provide us with items with classification under proposed list 3 of section 301. One of the options the supplier proposes is Drawback. We buy this item in the U.S. but at the same time export it for manufacturing in our subsidiary facility in Mexico. The supplier will need our export information for the Drawback claim. Is there anything we need to think of? Or be concerned of? Honestly, there are many things to be concerned about in this scenario. On the positive side, section 301 tariffs are subject to drawback so it is a good tool to consider when looking to minimize their impact on your company. Also positive, exports to MX for manufacture are valid exports even if they are later re-imported into the US. There are many ways to structure a drawback program when multiple parties are involved in the importing and exporting processes, but they all require additional documentation and good cooperation. How are claimants usually notified of liquidation? Will this happen in ACE moving forward? CBP mailed liquidation notices in the past, though that practice has long stopped. In ACE, its managed online. Is it normal to take over 3 years for your application to be approved by customs? You didn’t mention what kind of application you need approved. Ruling applications go to Headquarters in Washington and they do take longer. Applications for privileges are handled in the drawback offices and should move more efficiently. No application should take three years or more to be approved so your experience is not normal. That being said, your experience is also not completely unique either. We’ve seen too many applications for commercial interchangeability and specific manufacturing ruling requests drag on for years at Headquarters. I’ve even seen a drawback office take several years working on an application for waivers and accelerated payment. That situation was justified by CBP by multiple Account Management reassignments, among other things. While there may be some valid issues causing your delay, you should definitely be receiving regular communication from CBP. If you are not, follow-up. Where can I find information specific to Drawback and chapter 27 goods? Chapter 27 goods can be subject to any form of drawback; unused, rejected, manufacturing, and for some products (headings 2707, 2708, 2710 through 2715) petroleum drawback. Therefore, you’ll need to read all of 19 USC1313 and Subparts B, C, D, and Q of 19 CFR 190. In regards to the BOM, do you have to provide all HTS's on the BOM or only those that are imported parts? If there are items on the BOM that are never imported and will therefore never be a factor in your drawback claim, you can skip the HTSUS number. In fact, you can even skip those parts on the BOM you report to CBP. However, if there are parts on the BOM that can be either imported or sourced domestically and you file under substitution, you must classify them and report them on the BOM. Want to learn more? View this webinar on-demand. If you want to take on the task of Duty Drawback for your own organization, check out Global Trade Academy's Duty Drawback Specialization (DBS) courses, where you can learn how to complete a successful refund. We are hosting one more DBS course this year, November 27-29 in Houston, TX.